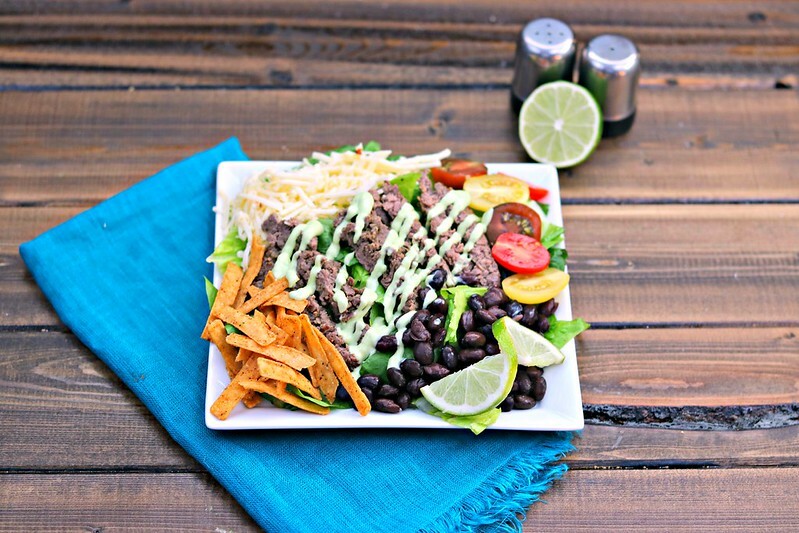 This steak salad with southwest flavors, pepper jack cheese, and creamy avocado dressing is a healthy meal option you don’t want to pass up! I looove a good entree salad. It’s sort of like a taco in the sense that you can pile all your favorite ingredients together. 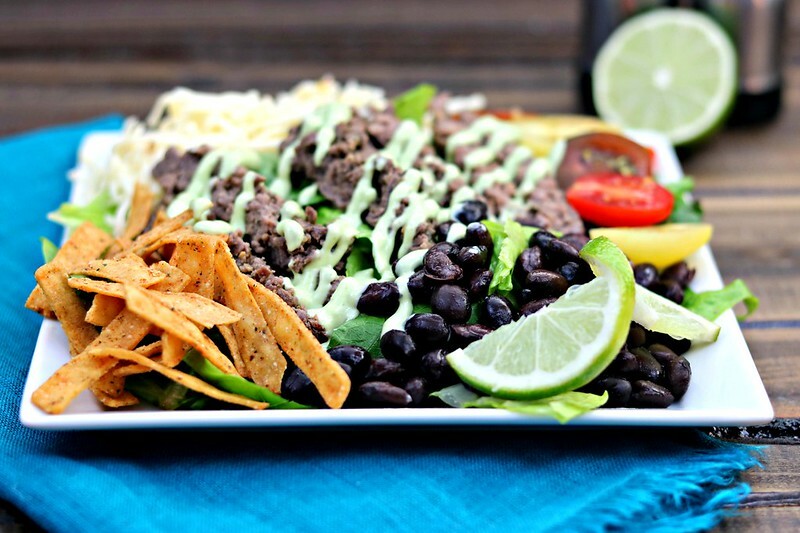 In fact, this particular salad would make an excellent taco! But I digress. This salad has it all. Your greens, two kinds of protein, dairy, carbs, and tomatoes and avocado. Tell me…what else do you need?? To me, this is very taco salad-esque, but without so much of the shell. Those southwest tortilla strips…y’all…THE best. They add just a little bit of crunch, that I just love in a salad. I think southwest flavors are really some of my favorite. I mean, I do live in Texas, so I guess it’s just ingrained in my DNA? Whatever it is, you can bet that if I hear or see “southwest” in a food title, my interest is definitely piqued. Every good salad needs a good dressing, right? Well..this creamy avocado, jalapeno, and lime dressing is better than good. It’s perfectly creamy, with just a hint of spice and a little zing from the lime juice. What could be more southwest than that?? Since life has settled down a little bit from the chaos of the past two months, I’m really trying to focus on getting back to a healthier lifestyle, and let me just tell you that I could eat this salad every day. J probably wouldn’t be down for that, because…variety and all, but it’s really that good. Try it, and you’ll see! 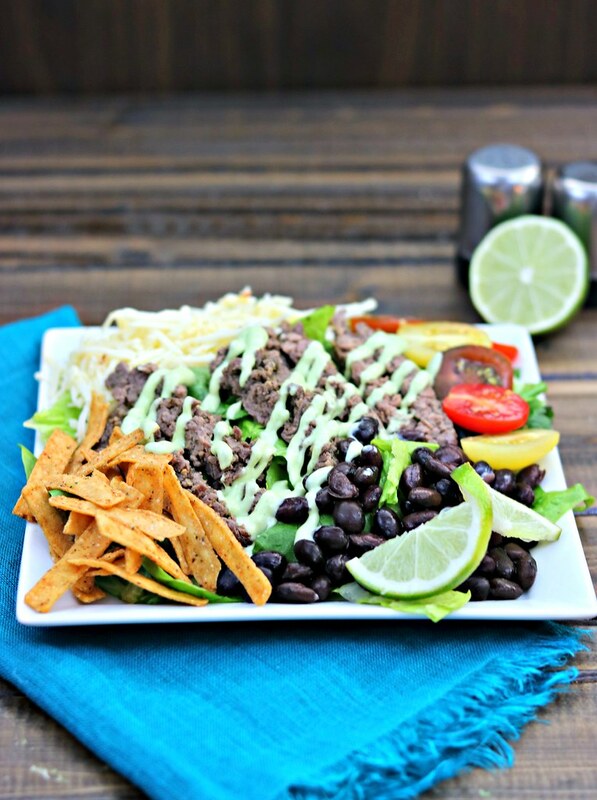 This steak salad with southwest flavors, pepper jack cheese, and creamy avocado dressing is a healthy meal option you don't want to pass up! Place steak in a shallow glass dish and pour chimichurri over the top. Turn to coat and allow to marinate for at least 10 minutes, to overnight. Add all of the Creamy Avocado Salad Dressing ingredients to a blender and blend until smooth, scraping the sides down as needed. Taste and add additional lime juice or water if you'd like it thinner. Season with salt and pepper, to taste. Set aside or refrigerate until ready to use. Heat a grill, grill pan, or skillet over medium-high heat. Use non-stick spray or olive oil if the pans are not non-stick. Once hot, add the steak and cook for 3-5 minutes on each side, or to your desired doneness. Remove to a cutting board and allow to rest for 5-10 minutes before slicing against the grain in 1/2" thick slices. Arrange remaining salad ingredients, greens first, in a large bowl (or divided amount smaller bowls) and top with steak slices. 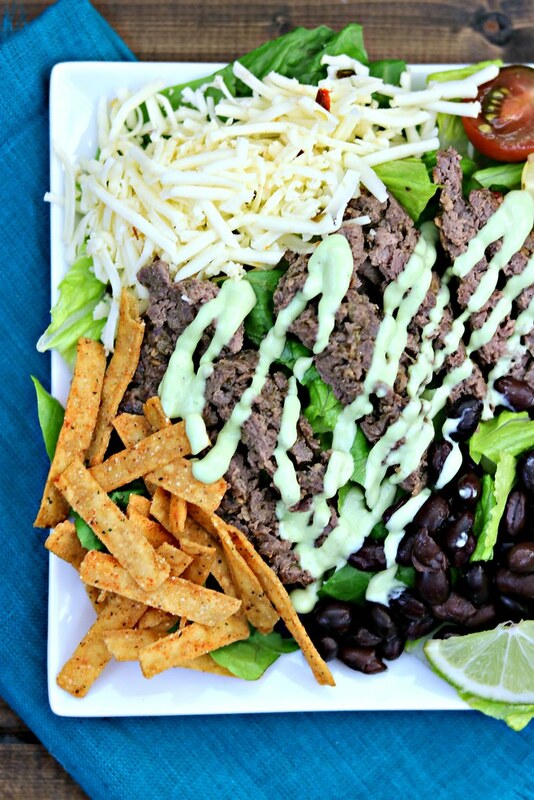 Drizzle (or douse, if you prefer) with the creamy avocado dressing, and top with tortillas strips. Bon appetite!